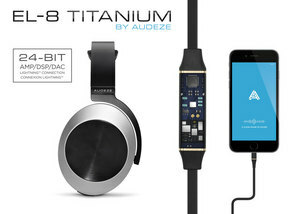 COSTA MESA, CA--(Marketwired - Dec 8, 2015) - Audeze, the award winning headphone manufacturer based in California, announced the release of its new EL-8 Titanium Headphones, its first with a fully integrated Apple Lightning cable with a built-in headphone amplifier and high-resolution 24-bit DAC. The EL-8 Titanium headphones provide users with true high resolution uncompromised audio -- not just for music playback, but for voice calls as well. The special model headphones utilize Audeze's award-winning planar magnetic technology, boasting a driver that is 4x larger than most others, giving dramatic bass response, low distortion, and a clear and open presentation. Keeping with the acclaimed Audeze aesthetic, the EL-8 Titanium headphones were designed by BMW DesignWorksUSA and feature an aluminum construction for lifelong pride of ownership. The EL-8 Titanium headphones come with an exclusive Lightning cable that streams a complete 24-bit digital signal through a high quality DSP and DAC to offer better sound quality. The built in microphone can be used for phone calls and Siri voice control. An accompanying Audeze app can be used to apply EQ and sound presets. For non-Apple device compatibility, the headphones also include a standard analog cable. The EL-8 Titanium headphones will be available in select Apple stores in US and Canada and online December 8th 2015. Audeze LLC is a California-based high-end audio manufacturer delivering the most accurate sound reproduction available today. Audeze products are engineered with the latest innovations in materials science and technology, matched with precision craftsmanship. Audeze's commitment to research and development is reflected in every facet of our handcrafted-in-the-USA products. DesignworksUSA is a creative consultancy that's been driving innovation for forty years. Acquired by BMW Group in 1995, DesignworksUSA enables its parent company as well as internationally-renowned clients outside the automotive industry to grow their businesses through a portfolio of creative consulting services. With clients including Coca Cola, Dassault Aviation, Embraer, John Deere, HEAD, HP, Microsoft, Bay Area Rapid Transit (BART), Siemens, Intermarine, and Varian Medical Systems, DesignworksUSA is deeply immersed in a broad cross-section of industries.